Jun 27, 2011 — VRINDAVAN, INDIA (SUN) — The writing of this notice to the devotees has been a long time waiting. Due to the mercy of Sri Sri Radha Damodar and now having email and Internet access, I am able to send out this information for the contemplation of sincere and thoughtful devotees. Since past five years the court case in India, ISKCON vs Radha Damodar Mandir has been going on. The case originally filed by ISKCON is primarily to solve the question as to who is the legal owner/proprietor of the rooms at Radha Damodar Mandir known as "Srila Prabhupada's Bhajan Kutir". As you know, Srila Prabhupada resided in these rooms for several years before he went to America and established ISKCON. In Srila Prabhupada's own words, it was by the mercy of Radha Damodar that he was successful in the West. A few months before the disappearance of Srila Prabhupada in 1977 the worship in Prabhupada's bhajan kutir began, and after Srila Prabhupada's disappearance, ISKCON continued paying rent to Radha Damodar Mandir and the puja of Srila Prabhupada continued. During the years that followed there were sometimes stressful situations that developed between myself and the ISKCON leaders and GBC in Vrindavana. Srila Prabhupada had always considered me like a son when I was growing up and he had great love for me, my father Shree Gorachand Goswami, my mother Srimati Durgadevya, my wife Tarulata Goswami, and my children in later years. My next to last son, Krishna Balaram, was named by Srila Prabhupada a few weeks before he was born. I went to see Srila Prabhupada a few days before his departure and he showed me the same love that he had always done. After his disappearance it seemed that his great love for my family had gone unnoticed by his disciples and we were soon regarded with great distrust and dislike. For two years, ISKCON stopped paying the monthly rent for Srila Prabhupada's bhajan kutir, and this began to put more stress on the relationship between Radha Damodar Mandir and ISKCON. Over the next years the relationship did not improve. 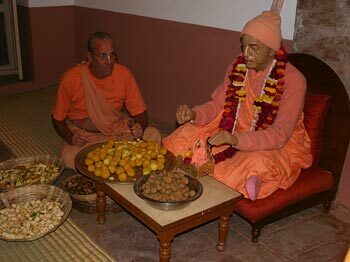 Finally in 2006 quarreling broke out between the Radha Damodara sevites and ISKCON sevites. The police in Vrindavana were called in to calm the situation and Srila Prabhupada's bhajan kutir was locked by police for one year. During that one year, ISKCON filed a case in the courts against Radha Damodar Mandir to claim that they owned the bhajan kutir rooms and not Radha Damodara Mandir. At the end of the first year the court made a temporary ruling that the rooms of Srila Prabhupada's bhajan kutir be opened and the courts ordered that ISKCON and Radha Damodar Mandir should share the puja in the bhajan kutir equally. One month for Radha Damodar sevites, who started first, and one month to be followed by ISKCON sevites. 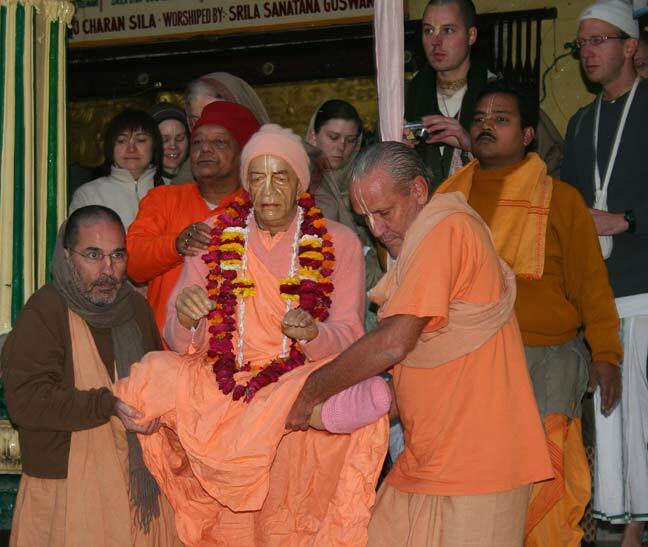 First, I want the devotees to know that the court case is not to determine who will do the seva-puja of Srila Prabhupada, but it is to determine who owns the rooms of the bhajan kutir at Radha Damodar Mandir. There is no doubt that in the end, the courts will rule that Radha Damodar Mandir owns the rooms, as they have been a part of the Mandir for almost 450 years. ISKCON has no legal documents to show that they own the bhajan kutir rooms, and so due to fear that all will be lost, they continue to drag out the court case, month by month. The case is now running five years. I have given this matter much thought and I am sure, as I am sure my readers are also, that Srila Prabhupada would not be happy with court cases between devotees of Lord Krishna, and especially court cases between ISKCON and Radha Damodar Mandir. With this consideration I have for the past three years tried to effect a reasonable compromise between ISKCON and the Radha Damodar Mandir, wherein Radha Damadar Mandir is the sole owner of said rooms and that the reasonable rents be paid monthly by ISKCON, both now and into the future, and ISKCON would eternally be given the right of seva-puja in Srila Prabhupada's bhajan kutir. Since last three years the GBCs, HH Gopal Krsna Goswamiji, HH Radhanatha Swamiji and HG Bheema Prabhuji and Panchagauda Prabhuji have met with me to hear my proposal for a compromise. Each time they agree and say, "Yes, yes, now we will do it and stop this fighting." After agreeing they go away and nothing happens, or to make matters worse, they file additional papers in the court, which are usually full of lies and fabrications on the issue. This is done just to drag on the case, but it escapes any intelligent and sincere devotee to understand why they are coming to me with compromise and then going away and doing just the opposite. What is their purpose and how is Srila Prabhupada pleased by such behavior, we cannot understand. Our humble appeal to all devotees in and out of ISKCON is that they should send letters to and request HH Gopal Krsna Goswami, HH Radhanatha Swami and HG Bheema Prabhu and Panchagauda Prabhu to meet with me (Nirmal Chandra Goswami) and settle a compromise once and for all on the issue of Srila Prabhupada's rooms at Radha Damodar Mandir. Failure to find a compromise means that the case will drag on for another 10 years, at which time the court limitations and tolerance will force the case to a conclusion. In conclusion it is not expected that ISKCON can win the case. But my readers may wonder why I am then asking for compromise when I know Radha Damodar Mandir will win the case? My answer is simple. I know that Srila Prabhupada is not happy with the court case or with the way in which his children are representing the case. If Srila Prabhupada were here today he would immediately send his GBC man to settle the matter to my satisfaction. Srila Prabhupada out of his love for the devotees at Radha Damodar Mandir would not rest peacefully until this was done. My humble dandavat pranams to all the devotees. To contact me directly on this matter please email to my son Krishna Balaram Goswami at the following: goswami.kb@gmail.com.